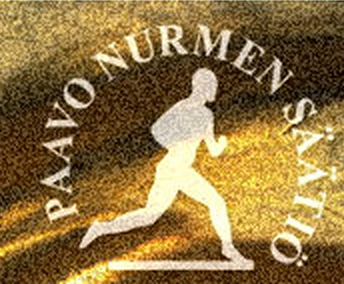 Paavo Nurmi was born on 13 June 1897 in Turku, a port town on the southwestern coast of Finland. In 1912 Hannes Kolehmainen “ran Finland onto the map of the world” at the Olympic Games at Stockholm by winning three gold medals in long-distance events. His races made an indelible impression on the 15-year-old Paavo Nurmi, who decided to do the same. Soon enough, Paavo got his first pair of running shoes and began serious training. 174 centimetres tall and weighing 65 kilograms at his prime, Paavo Nurmi was ideally built for a long-distance runner. In terms of basic training knowledge, Nurmi was self-educated. He was one of the first top athletes who had a systematic approach in training. Walking, running and calisthenics were the main elements of his harsh training regimen. He learned to measure his pace and its effects with a stop watch, and never raced without one in his hand. 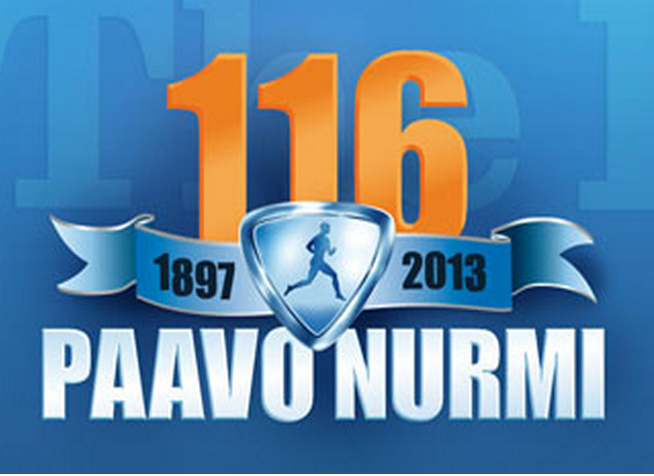 In 1914 Paavo Nurmi joined Turun Urheiluliitto, a local sports club that he was to represent all through his career. On 29 May 1920 in Turku he set his first Finnish national record. The distance was 3000 metres and the time 8.36,2. The Olympic Games at Antwerp made Paavo Nurmi a star in Finland, a worthy successor of Hannes Kolehmainen. His first Olympic race, the 5000 metres, ended in bitter defeat to Joseph Guillemot of France. This was to be the only time that Nurmi lost in an Olympic final to a foreign runner, however. In the following days he won gold medals in 10 000 metres and the cross-country race, adding a third one in the team event of the latter. In the three years following Antwerp Paavo Nurmi reigned supreme in the world of long-distance running. On 22 June 1921 in Stockholm he set his first world record: 30.40,2 in 10 000 metres. He went on to break world records in most distances from 1500 metres to 10 000 metres, meticulously executing his carefully planned time schedules with not much fear from competition. He once put his guiding principle to words: “When you race against time, you don’t have to sprint. Others can’t hold the pace if it is steady and hard all through to the tape.” In the end of 1923 Paavo Nurmi held the world records in three prestige track events: the mile, 5000 metres and 10 000 metres. No-one has done that before or since. In 1925 Paavo Nurmi toured the United States. During five months he raced 55 times and gave numerous running exhibitions. He won 53 of his races, abandoned once and lost only once. Most of these races took place indoors. During that spring Nurmi got more attention in America than any Finn before or after. The press called him “The Flying Finn”, the “Phantom Finn” or “The Finnish Running Marvel”. The demanding American tour left its mark on the great runner. Later in 1925 Nurmi raced a few times in Finland but broke no more records. In fact, in the Olympic distances he never did improve from his three world records made in 1924 (3.52,6 in 1500, 14.28,2 in 5000 and 30.06,2 in 10 000 metres). 1926 marked a turning point in Nurmi’s career. A slow decline had started, and his victory margins began to grow thinner. 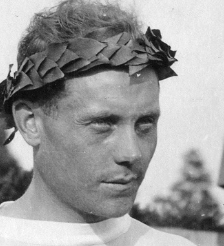 At 31 years of age, with eight gold medals and one silver, Paavo Nurmi had no great interest for further Olympic exploits. However, as success at the forthcoming Games would increase his market value at the American track circuit, Nurmi decided to go to Amsterdam after all. Once there, he won the 10 000 metres and came second in both the 5000 metres and the 3000 metres steeplechase. In autumn 1928, in an interview to a Swedish newspaper, Nurmi said: “This is absolutely my last season on the track. I am beginning to get old. I have raced for fifteen years and have had enough of it.” But he decided to go on, doing most of his running abroad from now on. In 1929 he embarked on his second American tour and in the next year he was back in record-breaking form, setting new world marks in six miles in London in June and in 20 kilometres in Stockholm in September. In early 1932 Paavo Nurmi trained hard for his fourth Olympic Games, perhaps more determined than ever before. He wanted to defend his title in the 10 000 metres, but his greatest ambition was to crown his career with a gold medal in the Olympic marathon, as Hannes Kolehmainen had done in 1920. In that spring, however, Nurmi was suspended from international competition by the International Amateur Athletic Federation following accusations of professionalism. Nurmi did go to Los Angeles and kept training at the Olympic Village in spite of the ban and a foot injury. Some witnesses claimed that he could hardly walk from his pains, let alone run. Despite pleas Paavo Nurmi was never allowed to race at the Los Angeles Games. Nurmi was reduced to the role of a spectator – he could not bring himself to watch the 10 000 metres or the marathon, however. Nurmi claimed that he would have won the marathon by five minutes. Once suspended and branded as a professional, Nurmi was not allowed to compete abroad. 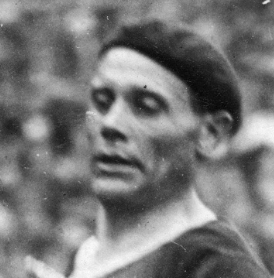 The Finnish Athletic Federation never accepted Nurmi’s sentence, however, and he continued to race in the home country until 1934, as a “national amateur”. Paavo Nurmi’s last race was a victory in 10 000 metres at Viipuri on 16 September 1934. Having wound up his running career Nurmi concentrated on a new one, as a businessman and building contractor. Since the 1920′s he had been building up his capital, investing wisely in the stock market. Paavo Nurmi made a considerable fortune, mainly in housing industry. 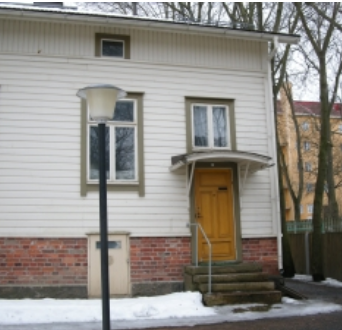 In Helsinki there are 40 town houses built by his company. In the 1930′s and 1940′s Nurmi sometimes took leave from his business commitments to train Finnish runners. Paavo Nurmi avoided publicity both in business and in private life but when needed he was ready to give service the society and Finnish sports in particular. In the war years his fame was put in good use to rally support for the Finnish cause, especially in America. Early in 1940 Paavo Nurmi went to the United States to raise funds for his country, which was currently waging an uneven war against the Soviet Union. He was accompanied by Taisto Mäki, who had just become the first man to run 10 000 metres inside half an hour. Mäki gave exhibition races, and the proceeds went to the Finnish Relief Fund. The Games of the XVth Olympiad were opened at Helsinki, Finland, on 19 July 1952. The identity of the last runner of the Olympic torch relay was a well-kept secret. When the electric scoreboard of the Olympic Stadium then flashed the text: “The Olympic torch will be brought into the Stadium by Paavo Nurmi”, there was first silence. Then 70,000 people began to roar. Many of those present burst into tears. After Paavo Nurmi had kindled the flame in the bowl the torch was taken to the tower of the Olympic Stadium, were another flame was lit by another Olympic hero, Hannes Kolehmainen. Intelligence, introversion and strong determination to achieve any goal were the main characteristics of Paavo Nurmi’s mental outlook. In his melancholy moments – more frequent in advanced age – he could even question his unparalleled achievements in sport: “Only real work, science and art have any true value.” Paavo Nurmi never retired from his duties. Having recovered from coronary thrombosis in the late 1950′s he worked hard until 1967 when the suffered another attack. In 1968 Nurmi set up a research foundation for coronary disease and public health and provided it with two multi-storey buildings and a substantial amount of money. Paavo Nurmi died in Helsinki on 2 October 1973. Obituaries all over the world praised his achievements. Marjatta Väänänen, the Finnish Minister of Education, said in her commemoration speech: “Records will be broken, gold medals lose their lustre, winners find their victors. As historical concept Paavo Nurmi will never be beaten.” On 11 October 1973 Paavo Nurmi was given a state funeral. The ceremony took place in the Old Church of Helsinki. From there he was taken in a motorcade to his native Turku where he was buried in the family grave at the Old Cemetery. Paavo Nurmi has been honoured in various ways. Several books and thousands of articles have been published about him in many countries. After the Paris Olympic Games in 1924 the Finnish Government ordered a statue of him from the most famous sculptor of the country, Wäinö Aaltonen. In 1952 two more copies of the statue were cast from the original mould: one was erected in front of the Olympic Stadium in Helsinki, the other in Nurmi’s home town, Turku. In 1983 the original statue, long kept at the National Art Museum, was placed in front of the Faculty of Physical Education of the University of Jyväskylä. 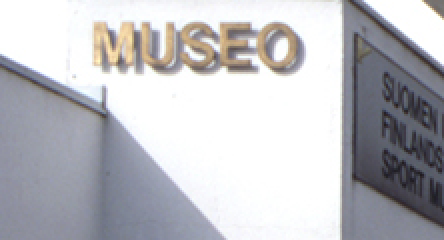 In 1994 one more copy was cast and sent to the park of the Museum of the International Olympic Committee in Lausanne, Switzerland. Medals and stamps have been issued and streets and even a small planet have been named in honour of Paavo Nurmi. In 1987 the Bank of Finland issued a ten mark note featuring Paavo Nurmi on one side and the Olympic Stadium on the other.